Egg Bhurji is the most popular Indian dish which is prepared with eggs, onions, tomatoes and other spices. It's also referred as Indian style scrambled spicy eggs. It tastes awesome with Chapati's or Roti's. If you are new to the cooking world , do try this out and you will love it. It's an all time favorite dish for us. My father loves it the most. Its one of the few dishes which he loves to demand. 1. Heat a frying pan and add in 2 tsp of oil. 2. Add chopped onions and saute it till they turn translucent. 3. Now add the chopped tomatoes and cook till tomatoes become soft. 4. Add haldi, red chilli powder, coriander leaves and salt. Mix well. 5. Drop in the beaten eggs and mix well. 6. Saute it for 2-3 mins till the eggs are cooked and the desired scrambled eggs are formed. 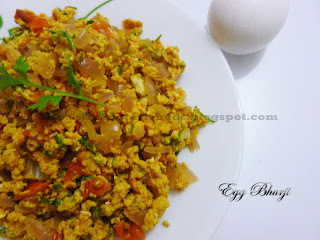 Egg Bhurji is ready to be served. Add in any spice powder like jeera powder, garam masala powder or even a pinch of pav bhaji masala to give a twist to this regular simple Egg Bhurji.